Tarpon action at Barra Colorado is wide open despite some heavy off and on rains in the area according to Rio Colorado Lodge operator Dan Wise whoreports that last Sunday and Monday there was heavy morning rains that cleared in the afternoon, an anglers fishing outside the river mouth had constant double and triple hook ups. A group of six anglers jumped 68 tarpon and boated 26 Friday, Saturday and Sunday, and also reported that a good showing of wahoo and tripletail and oñccasinal tuna spiced the action, Dan said.. Fishing at the lodge three days last week, a party of 18 anglers jumped 93 tarpon and got, 26 to the boat while another six fishermen, had 68 of the silver rockets in the air, boating and releasing 26 in three days. Tarpon action is likely to continue into early or mid-December. Calba (fat snook) are already making an early show, but traditionally move into the area in large numbers this month (November) and action continues through most of December, and there´s no better opportunity to fill the freezer with the great eating small snook that are caught up the river and are dinamite on light tackle. 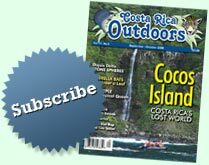 Dan said the Rio Colorado Lodge is offering a special calba fishing package discount for Costa Rica nationals and residents of $100 per day off their regular prices through November, including guide, boat, tackle, lodging, all meals and and happy hour rum drinks in the bar. Not included are lures, fishing licenses or transport to and from San Jose. Call the lodge´s Hotel Corobici office at 232-4063 or Dan´s cell, 816 2882 for more information. No reports from any boat operators, lodges or fishermen on the Pacific coast, so assume they aren´t catching enough to talk about. We received an email from George Bassel, on behalf of Peter Aspinall and the hotel association in the Golfo Dulce regarding a proposed tuna farm that would create an immense spread of nets to entrap tens of thousands of tuna for commecial purposes. He asks that those opposed to this project to fax the ICT at 220-3559 and lodge their protest tp this project that would severely damage and likely destroy a sport fishing resource that brings far more benefits to Costa Rica through tourism than would a commercial venture that benefits only the canneries while adversely affecting hotels, sport fishing lodges, charter boats, international and in-country airlines, tour operators and others while destroying a valuable natural resource through indiscrimate harvesting of a recreational resource that benefits only a few. To submit fishing reports, for more information on fishing or assistance planning a trip, fishermen, skippers and guides can call Jerry at 282-6743 or email him at jruhlow@racsa.co.cr. Fishing reports should be submitted as early as possible by Monday of each week.